As I’m entering my ninth year as your County Attorney, I wanted to bring focus to one of the ways that we seek to reduce crime in our community; by keeping the right people off the streets—the repeat offenders. In many areas we see that, on average, 10% of offenders commit roughly 90% of the crimes. You might hear of a rash of burglaries in a certain neighborhood, and chances are, they are being committed by one individual or one group. If you take that one person or group off the streets, you’re preventing several more crimes. In this issue, you’ll meet a couple of our prosecutors who specialize in handling these cases involving repeat offenders. We’ll also highlight a few of those cases to give you more insight. We’ve enhanced our ability to identify and prosecute repeat offenders by employing several new initiatives since I’ve been in office. If you’re a regular reader of this newsletter, you’ve read about our Community Based Prosecution model. By building close relationships within defined geographical boundaries, we have a better view of the crime problem unique to each area. Our Office has also built a crime strategies team and has employed Intelligence Focused Prosecution, allowing us to assist law enforcement agencies in identifying those repeat offenders and giving our prosecutors the information they need to seek appropriate sentences, taking into account the chronic nature of a particular individual’s criminal behavior. We use data to identify those most responsible for committing crime in our communities and those engaged in violence to protect those who simply want to live, work, and raise their families in peace and safety. 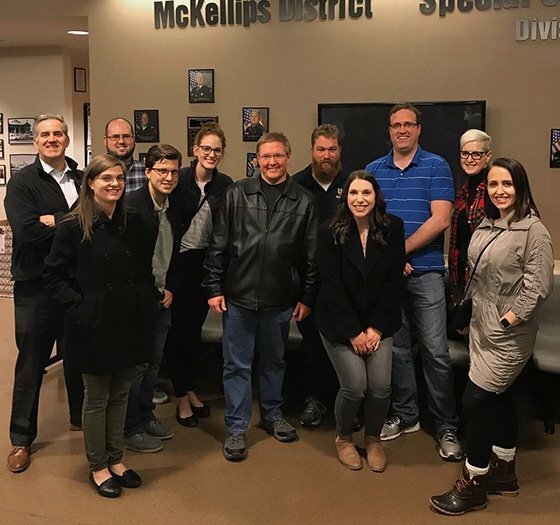 The Repeat Offender Program (ROP) Bureau at the Maricopa County Attorney’s Office was created to address the criminal justice concept that roughly 10% of criminals commit 90% of crimes. As law enforcement agencies make strides in getting repeat offenders off the streets, the MCAO team of 13 experienced ROP attorneys and staff protect our community by ensuring these repeat offenders stay off the streets. Repeat offender policies at MCAO are far stricter than those faced by first-time offenders and typically present defendants with a choice of pleading to the most serious charge or heading to trial. Because of the risk to public safety they pose, repeat offenders are generally ineligible for diversion programs or probation. The ROP Bureau is led by Mitch Rand, a career prosecutor with more than 30 years’ experience. Two of our ROP prosecutors, Kevin Okano and Josh Maxwell have a combined 20 years with the Office and both report seeing drops in specific offense categories when they hold these career criminals accountable. “Typical ROP offenders have long criminal histories and many of our dispositions involve prison,” reports Assistant ROP Bureau Chief Kevin Okano. Major Offenders Division Chief Jon Eliason sums up the important work being done by the ROP Bureau, “ROP is a bottom up program. Communities suffer when prolific offenders repeatedly rob, steal, and defraud citizens. Trained police officers use objective criteria to identify those predators who are most prolific. The role of the ROP Bureau is to protect the community through vigorous prosecution of high volume criminals and the ROP team is full of dedicated staff and prosecutors who understand and rise to the challenge.” Josh and Kevin love being ROP prosecutors and aside from spending more time with their families, both report they wouldn’t change a thing. Attorneys in ROP prosecuted nearly 1,200 felony cases last year, including some of these dangerous career offenders. After being found guilty by a jury, Francisco Nieblas Rodriguez (D.O.B. 03-15-1988) was sentenced on November 30, 2018, to 33 years in the Department of Corrections after being found guilty of seven counts of armed robbery, two counts of attempted armed robbery, seven counts of kidnapping and nine counts of aggravated assault. 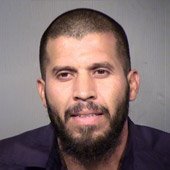 From mid-April through the end of December 2016 the defendant, referred to as the “Bearded Bandit” targeted and robbed six different check cashing businesses in Phoenix and Glendale. He would approach a female employee, usually when they were alone at the locations toward the start or close of the business day and would point a gun at them demanding money. Once the defendant had been given all the cash available, he would leave the location before police arrived. Investigators were able to identify a vehicle likely connected to the robbery suspect and were able to track it to a home in Peoria where they found the defendant leaving the residence. Investigators located a black leather cap under the front passenger seat that matched the one the suspect had worn in all the robberies and they located a gun that was the same color used in the crimes. Additionally, several of the victims were able to identify the defendant in a photo lineup as the man who held them at gun point during the robberies. When interviewed about the crimes the defendant denied involvement but remarked that the suspect was handsome like himself. The defendant robbed six banks between November 2010 and August 2015. The last bank robbery occurred in Chandler on August 4, 2015 and Villa fled in a getaway car. 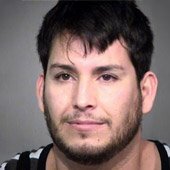 Chandler PD found the defendant fleeing the bank robbery scene and attempted to stop him. The defendant fired a handgun at the pursuing officers. Bullets struck two of the police cars, on the hood, and the windshield and spotlight. Officer Joshua Pueblo returned fire and fired one round, but his handgun had a misfire and jammed before he could fire any further rounds. 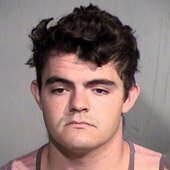 The chase started in Chandler and moved to Phoenix and Tempe, where the defendant abandoned his car and ran to a nearby movie theater on Mill Avenue where he intended to hide. Police caught him before he could pay for the ticket. The defendant set the stolen money and gun on the ticket counter where it was recovered. The MCAO charged the defendant for attempted murder of police officers and aggravated assault on police officers. 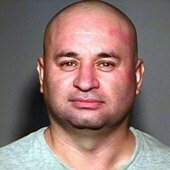 Counts 1 and 2: Attempted first degree murder of Chandler Police Officers Joshua Pueblo and Judy Crossman resulting in 28 years concurrent with the Arizona Department of Corrections. Counts 3, 4, 5, and 6: Aggravated assault on police officers resulting in 25 years to life on each count concurrent. On March 22, 2018, Defendant Noel Rey Santos fired a handgun at Scottsdale Police SWAT officers as they walked up to his front door to carry out a search warrant. Santos fired a handgun from inside the house. At least one round went through the front door which caused metal and wooden fragments to hit the two officers closest to the door. While officers took cover behind their SWAT vehicles, Santos hid the gun inside an interior wall of the house. He then barricaded himself for hours. Phoenix Police officers arrived on scene. They successfully caught Santos near a shed in the backyard area of the house. Multiple people were inside the house at the time Santos fired the handgun, including a 10-year-old child. A jury found Santos guilty of all five counts of aggravated assault with a deadly weapon. Santos is a nine-time convicted felon, with prior felony convictions for assisting a criminal street gang, forgery, trafficking in stolen property, and unlawful flight from police officers. Sentencing will take place in early 2019. 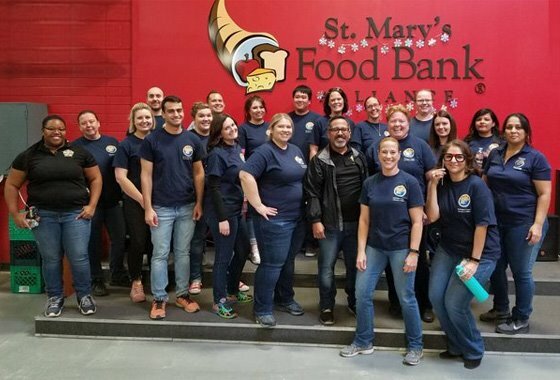 Community Based Prosecution Phoenix Central Bureau volunteered at St. Mary’s Food Bank and boxed 16 pallets worth of food! The television show “American Pickers” follows a team of antique and collectible “pickers” who travel the U.S. selecting old items from people’s garages, basements and barns. What most people see as castoffs, the pickers see as “dollar signs.” They recycle and reuse their picks, finding new homes and new uses for forgotten junk. The Maricopa County Attorney’s Office also has a successful team of pickers. 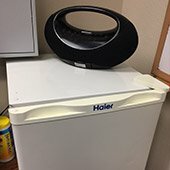 Antonio Canisales and Josh Dukelow in Administration are leading the reuse and recycling efforts for the Office and have found some amazing things buried in old MCAO filing cabinets, tucked in hidden corners of storage closets and even in the back of desk drawers. 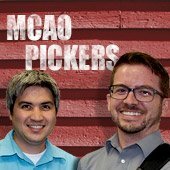 Last June as the fiscal year drew to a close, Finance Bureau Chief Catherine Martin noted that the MCAO year-end supply inventory was valued at more than $157,000 – including everything from general office supplies like pens and paperclips to discs, mailing labels and miles of file tabs. As a result, one of the MCAO fiscal year 2019 initiatives is to reduce on-hand office supplies by 50% before the end of the fiscal year. To accomplish this feat, Division-led inventories have been completed across the Office. Catherine and her team analyzed and consolidated the inventory results and then returned final reports to the Divisions, helping them gauge what was available office-wide and encouraging everyone to change their mindset from “purchase” to “reuse.” Now instead of automatically placing an order for 10 boxes of new pens, a bureau can check the available inventory lists and make the request of another bureau who is flush with pens. In addition to general office supplies, the inventories found that printer ink and toner cartridges represent close to 25% of the value of our on-hand new inventory. The cartridges around the Office were collected and now there is a centralized Office location for all printer and copier supplies. An employee can easily make an online request for a magenta or cyan cartridge and it can be picked up within two hours. After the inventories were completed, Antonio and Josh took the recycling reins and charged ahead with the effort, unearthing lots of MCAO surprises, turning trash into treasures and helping the Office reduce our impact. Handcarts were found that needed some love, computer bags with some more uses in them and even small appliances were discovered. Although their work has proven successful in reducing our overall inventory of stuff, Antonio and Josh are often left with “difficult to place” items or things that simply can’t be repaired. A working stereo, several compact refrigerators, tape recorders, binders and more binders and pull carts are just some of the little treasures the team has been bequeathed as the effort enters the halfway mark on the calendar. Not only have Antonio and Josh become experts at spotting the life left in discarded Bates Stamps and clipboards, they have become matchmakers for on-hand stashes of notepads, CD-ROMs and red pens. One bureau’s unused white board is a lifesaver for another bureau. The team works to re-home the excess items they have found before sending them to Maricopa County Risk Management for recycling or off to County surplus. 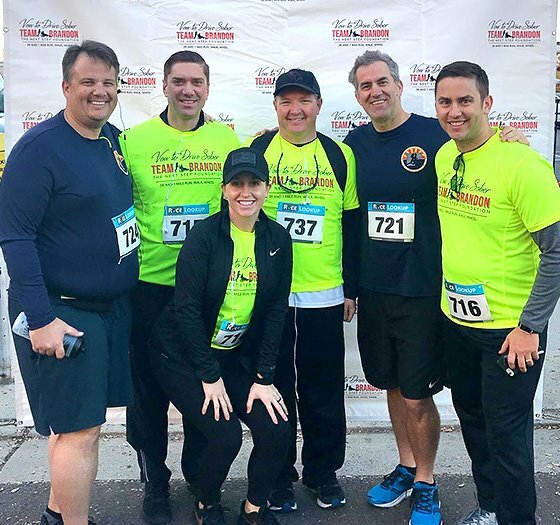 Maricopa County Attorney's Office Run Team participates in the Walk for Brandon and the Vow to Drive Sober 5k. These are a few runners from MCAO's Major Offenders Division. The opioid epidemic and related overdose deaths are rising nationwide, and Maricopa County is no exception. Families of those who have died of overdoses and law enforcement are coming together to look at whether illicit drug dealers can and should be held accountable for deaths that occur with the sale of drugs. On November 16, 2018, a joint training on Opioid Related Death Investigations and Prosecutions was held for the Maricopa County Attorney’s Office, the Arizona Attorney General’s Office and the United States Attorney’s Office for the District of Arizona. Jeff Beaver, Bureau Chief of MCAO’s Drug Enforcement Bureau, was one of the presenters, and he shared information with the group about how Arizona’s existing homicide statutes could be applied in these scenarios, and the limitations on potential prosecutions. During the training, Beaver used the prosecution of Defendant Javier Luna (CR2017-005952-001) as an example of such a case. Back on November 25, 2016, Luna provided fentanyl to a friend of his who overdosed in front of him. Instead of immediately calling for medical help, Luna tried to revive the victim on his own. Several hours went by before he finally called paramedics. By then it was too late, the victim died at the hospital early the next morning. Law enforcement submitted the case for homicide charges to MCAO. 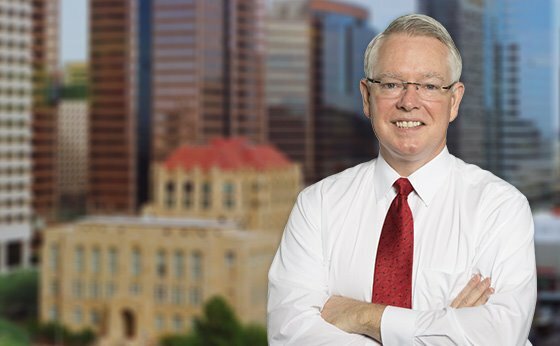 However, after a thorough review—including conversations with the Maricopa County Medical Examiner’s Office—MCAO determined that they could not meet the “reasonable likelihood of conviction” threshold to bring homicide charges. Despite being unable to bring homicide charges, MCAO was able to charge Luna with multiple counts of the sale/transfer of drugs, possession of drugs, and auto theft, which resulted in a sentence of 15.75 years in prison. Despite the fact that homicide charges were not filed, the victim’s family was satisfied that Luna was held accountable. Beaver encouraged our law enforcement partners to fully investigate opioid death scenes to provide the necessary evidence that will allow prosecutors to appropriately charge these crimes. Jadyn Curtis was sentenced to natural life in the Department of Corrections after pleading guilty to 1st Degree Murder. Curtis also received a consecutive life sentence for Sexual Assault, and consecutive 21-year sentences for Kidnapping and Armed Robbery.